customers find you online, and not the other way around. The first phase is turning a stranger to your business into a visitor. This is done by drawing in new contacts to your website by answering the questions they are asking online, specifically with blogging and SEO. Once the visitor is on your website, make sure you’re offering multiple places to convert. This can be done by having clear call-to-actions, landing pages, and forms strategically placed across your website. At this point, the contact has now given you their information and ready to be nurtured through the buyer’s journey. This involves email marketing nurturing for leads, or beginning the sales process for marketing qualified leads. The sales person has qualified the lead, and they have successfully sealed the deal. But the work isn’t done yet. You need to continuously engage with your customers and provide ongoing support. 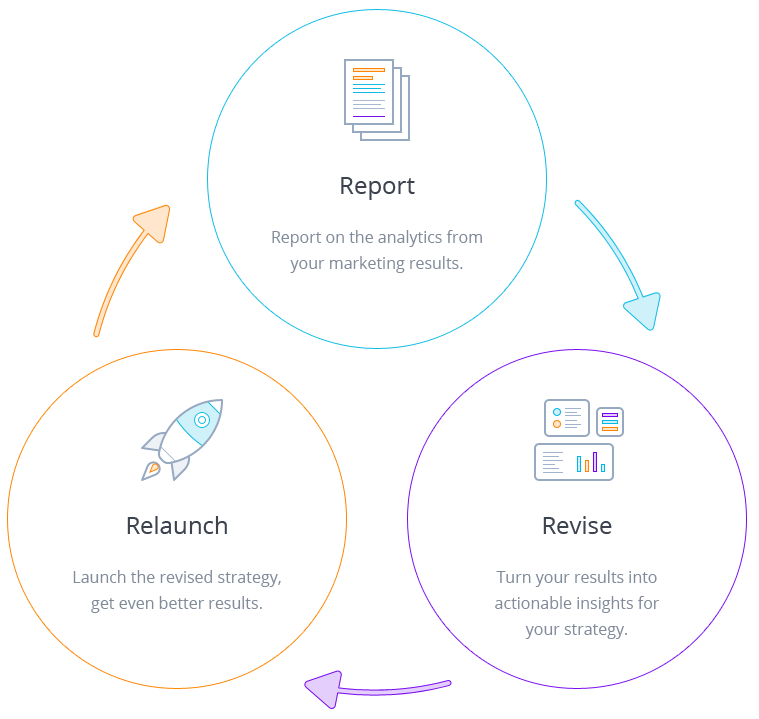 The first phase of your inbound marketing plan is setting the foundation for your long term goals. This part of the process will be happening “behind the scenes” as you’re getting started. Before getting started with anything in inbound marketing, you need to take the time to define and build out your ideal buyer profiles, known as your personas. Typically this will be 2-3 profiles that will define your strategy, your goals, and your messaging from here on out. Before you can set goals or determine the quick wins for content, it’s important to take a snapshot in your marketing performance to date. This involves completing a content audit, competitor analysis, website audit, and keyword research. The goals you set are what will keep you, your agency, your sales team – and your whole company, aligned and help everyone come together as one team. All your inbound efforts and deliverables can (and should) be tied to reaching these defined goals. Once you know the people you need to reach, the benchmarks and resources available to you, and the targets you need to hit – now you’re ready to begin outlining your content strategy. This involves outlining the first offers and blog posts you plan to produce. While the inbound marketing foundation is being built, a quick win strategy will be put in place to bring in results as soon as possible. This might include easy fixes on the website that will increase the conversion rate, or repurposing existing pieces of content into gated offers to send leads to. Once It’s Built, Launch It! time to launch and bring in the leads. You have to give to get. We’re here to make sure you’re offering the right resources to your target market. Content, content, content. We’ll make sure you stay at the forefront of content creation and continuously build your SEO. Having an active social presence helps increase followers, drive traffic to your website, and ultimately – drive more leads. Email isn’t dead. It’s still one of the most powerful tools you can have in your digital marketing strategy. now you’re ready to launch it. Hüify is ready to help you define your goals and create a plan to meet those goals. Get in touch with an inbound marketing expert by filling out the form.